In the first part of our series on in-band signaling, we discussed one of the most common and easily recognizable forms of audio control, familiar to anyone who has dialed a phone in the last fifty years – dual-tone multifrequency (DTMF) dialing. Our second installment will look at an in-band signaling method that far fewer people have heard, precisely because it was designed to be sub-audible — coded squelch systems for public service and other radio services. To review, an in-band signaling system is loosely defined as any system that sends control information along with the main content of a transmission. In the case of a telephone call, the main content would be the conversation you have with a friend on the other end, or shouting at the voice response system that’s currently screwing up your electric bill. The control signals would be the DTMF tones sent by your phone to the telco central office to connect your phone to your friends, or the angry mashing of keys to try to get connected to a human being. In both cases, the DTMF tones travel on the same channel, or band, as the voice conversation, one-sided though it may be. In-band signaling works in radio transmissions, too, as a way for one radio to control another. The most common form of remote control is the squelch system. Ham radio operators and other two-way radio users will no doubt be familiar with the squelch control on a receiver, which is used to manually set a threshold which an incoming signal needs to be stronger than to be heard. This quiets the constant white noise and blanks out distant, weak transmissions. Automatic squelch systems are a little different: a receiver stays quiet until it detects a coded signal from a transmitter, at which point it opens the squelch and allows the transmission to be heard. Probably the place that most people are familiar with it is with those blister-pack two-way Family Radio Service (FRS) radios you buy at Walmart for a couple of bucks. All those little UHF walkie-talkie radios have some sort of “privacy code” feature, which is actually a coded squelch system. Automatic squelch systems came along very early in the days of two-way public service and business radio. With limited bandwidth and lots of users on the air, radio manufacturers came up with ways to share frequencies without necessarily hearing all the transmissions on the channel. A florist could share the same frequency as a tow truck operator, for instance, but each company would only hear their own traffic. That was the theory, at least; such features are rarely as simple as the marketing team makes them seem. Early squelch systems were based on “subaudible” tones that were transmitted every time the transmitter was keyed. The tones, ranging from 60 Hz to 250 Hz or so, were clearly in the range of human hearing, but given the limitations of audio reproduction at the receiver, the tones were effectively inaudible. But they still got modulated onto the carrier, and once decoded the receiver would break the squelch and allow all the radios set to the same tone to hear the transmission. Early radio used vibrating electromechanical reeds, essentially tiny tuning forks attached to a small coil of wire. Audio from the receiver was fed through the coil, and if the correct PL tone was present, the reed, resonant for that frequency, would vibrate and make close contacts to open the audio channel. Tones were encoded on the transmit side with similar reeds. 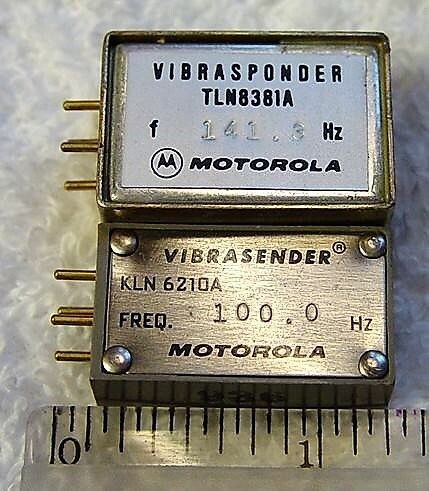 Resonant reed PL systems were the state of the art well into the 1980s, and more than a few amateur radio repeaters in service today are based on old Motorola UHF and VHF base stations that have been retuned and still have reeds in them. As sketchy as reeds may seem from a modern perspective, especially given the solid state phase-locked loop decoders that replaced them, the reeds were robust and reliable under often harsh mobile and remote conditions, and were marvels of miniaturized electromechanical engineering. But technology marches on, and eventually CTCSS systems were joined by digital coded squelch (DCS) systems. Implementations vary, but Motorola’s “Digital Private Line” or DPL became the standard. It mixes a continuous 134-bps square wave into the audio signal and provides 83 separate codes, far more than the 38 tones PL specified. Two-way land mobile radio technology has come a long way since the early days of vibrating reeds in transceivers stuffed with vacuum tubes that took up most of a vehicle’s trunk space. Today’s entirely digital trunked systems resemble packet-switching networks and rely heavily on out-of-band signaling for control. But in-band signaling for squelch control isn’t going anywhere anytime soon. I hate to be that guy.. But could we possibly get a better cutout of that radio? It looks like someone used the wand tool in Photoshop. I see your point but… why care? In a day or two this post will be buried under the newer ones anyway. Also… I’m not sure but maybe the artist was going for that effect. The white background edges kind of go with the bright spots in the waterfall display giving it sort of a 1980s Trapper Keeper look. Hmmm. I’ve been interested in making my own pl encoder with a microcontroler and a resistor ladder for a while now. I didn’t really even think about adding DCS but given the description here it seems doable. Then again… I know of no-one nor any repeater that actually uses DCS. I once made a PL encoder from an Arduino UNO and some passives simply by programming it using the “tone” command. It worked well enough to open squelch on several different local repeaters when I hooked it up to an old VHF radio that lacked a built in PL encoder. I didn’t keep it (or the radio for that matter) as it was just a fun experiment to see if I could do it. When I was in the U.S. Army, radios had “Squelch” and “New Squelch” switches. “New Squelch” was a 150Hz tone in the audio transmission. I always wondered if the tone squelch we had on aircraft HF radios was the same as used for old firefighter belt clip voice pagers. You can hear both tones. What’s to stop a prankster from stopping the rails at a whim? You can set off the fire sirens in many volunteer fire districts with dtmf tones even still. But it’s a Bad Thing to Do. So with CTCSS and DCS you cant hear other people using the radio if they use a different tone. What stops you accidentally transmitting over the top of them? You can’t her others if you have the tone squelch in operation. A receiver without it would hear everything. But I have been wondering before this about duplicate transmission. My guess, and only guess, is that if you receive a signal, it disables the ability to transmit. But that ignores some situations, like a high receiving antenna so you might not hear another signal on the frequency. And if a repeater is involved, you wouldn’t be receiving on the same frequency as you were transmitting. Cheap PMR446 radios doesn’t care if somebody already transmits on a channel, they’ll transmit anyway and you know what happens. Some (more expensive) Kenwoods, which are basically UHF radios “degraded” to license-free PMR446 radios, can be configured to prevent transmitting if channel is busy. Some stores around here advertised CTCSS tones as “encryption”, where did that come from? Naturally I didn’t correct them, that’s bad for listening. On commercial radios, there is usually a red/green indicator light that says when it’s okay to transmit. In fact I think some won’t let you transmit unless it’s open. I’m sure that’s changed in the last 20 years since I sold Vertex HT’s. There is basically nothing stopping you from doing that. Some radio’s (like the cheap Baofeng 888S radios) have a red/green indicator LED that turns RED when receiving CTCSS or DCS signals that don’t match the channel setting without breaking squelch, so you can see someone else is on the channel. Here’s a novel approach to coded squelch. No tone encoder needed at all. You can use a stock 2-way radio on any band and modulation. FM mode is preferable as signal tends to be cleaner. AM and SSB could be problematic due to audio background interference but not insurmountable for programming and maybe a audio DSP hardware thrown in. This would be a coders/programmer’s project not electronics hacking.